Sometimes inspiration for a project can begin in an unexpected place. The genesis of this bird feeder came from a vintage birdhouse I purchased from my friend Jane at 1 of A Kind. I was really drawn to the detail of the "bird cottage" and loved the old paint job. It's more of a home for spiders since it sits in my workshop in my craft paint corner for the sole purpose of inspiration. 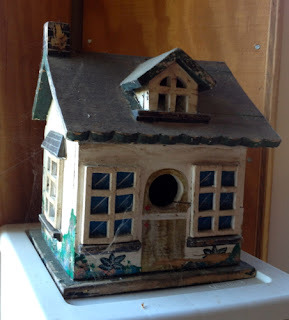 I had purchased about a half dozen unpainted balsa wood bird houses from an estate sale awhile back and they had also been sitting in my workshop collecting dust until I came upon the bird cottage and finally had the inspiration I needed to get out the craft paint. I wanted my new house to have the same old worn look as the cottage so after a coat of primer, I mixed up some craft paint to a salmon-pink for the main body. I painted the railing white to represent a cottage's picket fence and the base green to represent grass. I love the look of aged copper so to give my roof a mossy aged feel I mixed a little metallic copper paint with some water and a little terra cotta paint. While the paint was still wet I added a little green where natural aging might occur. After it was dry I sanded the whole gazebo and gave it a coat of Fiddes Supreme Wax in Rugger Brown to for an antiqued look. 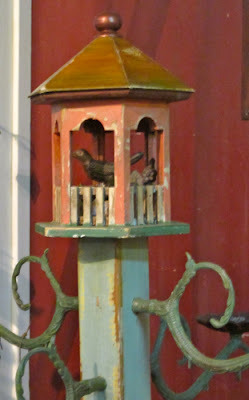 I happen to have a rusted cast iron bird finial that fit inside the gazebo so had to find a way to use it. I found an old blue painted turned post that was a good scale to the gazebo. I liked the color as it was so I just did a bit sanding and gave the post a coat of Fiddes Supreme Wax in Light just to give it a finished look. Then, drilling a hole in the bottom of the gazebo, I simply attached it to the post using the finial and a dowel screw. 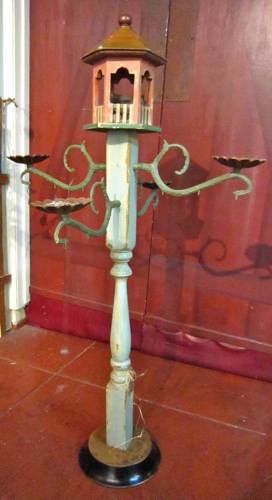 The square top section of the post was a perfect place to add arms so I took four arms from a vintage chandelier that I had aged with a rust patina solution giving them a beautiful verdigris finish followed by a coat of spray sealer. I then attached rust cast iron bobeches where the light fixture would have been mounted on the chandelier using brass caps that I also aged and sealed. The base was a large wood base from a floor lamp. I wanted to repeat the rusted look at the bottom for balance so I used iron oxide paint and rust patina solution for the top of the base. I decided to paint the bottom portion of the base black to pull to whole thing together. Tip: This is a old decorating tip but I believe it works for project design as well. It is said that every room needs a little black because it helps ground the color scheme. In my experience, this is a true statement. When a project just doesn't look quite right, try adding a little black. Add a little bird seed to the dishes and you have a party feeder for the birds. It reminds me of the Summer Concert Series on Friday Nights here in Paso Robles. The band sets up in the gazebo and the town gathers around with their picnics....makes you just want get up and dance!